Posted in The Travel Troubleshooter Tagged BANKRUPTCY, CHARGEBACK, CHASE, CONSUMER PROTECTION, CREDIT CARD CHARGEBACK, Fair Credit Billing Act, FCBA9 Comments on Airberlin is out of business. How can I get a refund? When dead airlines rise, where’s my refund? 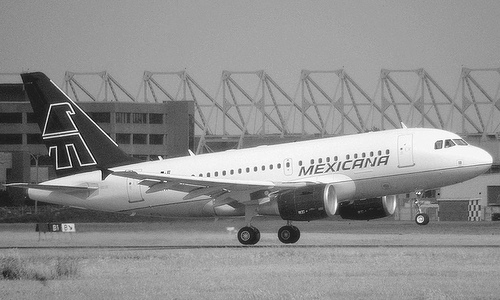 Duncan Fox saw a glimmer of hope when Mexicana Airlines recently announced it would return to the skies. Back in 2010, he’d booked a flight from San Francisco to Puerto Vallarta, Mexico, but shortly before his trip, Mexicana filed for bankruptcy protection and then folded. Posted in Commentary Tagged ALITALIA, BANKRUPTCY, MEXICANA, PROTECTION, REFUND91 Comments on When dead airlines rise, where’s my refund? Noah Markewich’s lost-luggage case had “lost cause” written all over it when he contacted me last week. Why? It involved Alitalia, the historically troubled Italian airline. It was more than three years old. Old cases are almost always unsolvable. And it involved misplaced baggage, which is a problematic complaint category. Still, Markewich epic, four-page, single-spaced letter is such a stunning documentation of an airline’s awful customer service, that I wish I could publish it in its entirety. It describes how Alitalia ruined his Italian vacation by losing his luggage — and when I say “ruin” it may be something of an understatement. It’s no secret that the airline industry has seen better days. But how bad is it this time? Not as bad as the mainstream media would like us to believe, according to airline analyst Robert Herbst, who publishes the Web site Airlinefinancials.com. And not so good that we shouldn’t be cautious with future bookings, he adds. In the above chart, you’ll see a few first-quarter numbers for the major airlines as they compare to pre-bankruptcy. None of the airlines are in serious danger of coming close to the dreaded red bar. Although Spirit Airlines denies reports that it’s on the verge of making massive cutbacks, there’s evidence the no-frills discount carrier is quietly dismantling its customer service department. Well, that may be an overstatement. But it’s not much of one. Earlier this year, I published the names and e-mail addresses of Spirit’s executives. It’s a courtesy I extend to every airline with passengers who have service problems. Spirit’s response? It apparently changed its e-mail addresses so that it wouldn’t have to deal with its own customers. None of the addresses currently work, but if there are any Spirit employees out there with the correct contact information — well, you know how to reach me. Since then, I’ve received numerous reports of customer service inquiries simply being ignored. Two of them landed in my “in” box just this morning. Here’s one from reader Helen Leung, who recently returned from her honeymoon in Jamaica. Not only did Spirit charge her $20 to transport her luggage, but it lost her belongings and then refused to reimburse her for the clothes she had to buy on her vacation, even though she presented the airline with the necessary receipts. “Spirit Airlines apparently handles their problems by ignoring their customers through phone and mail,” she told me. I’m not sure if Spirit has fired its entire customer service department, but I wouldn’t be surprised if it’s made cutbacks or has instructed its agents to hold the line on any refunds. Either way, this is a deeply troubling sign. Spirit was never a standout when it comes to customer service, but refusing to answer inquiries from its passengers could be a sign that the cutbacks everyone is talking about may actually represent a best-case scenario. The worst-case scenario? Well, that’s where Spirit actually lives up to its name.